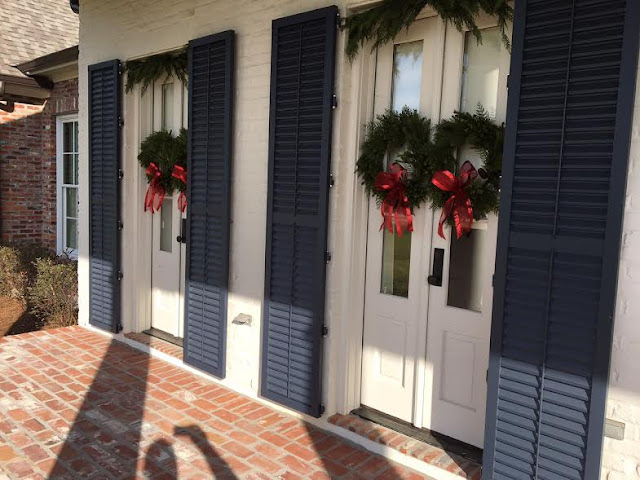 Only in South Louisiana would one sweat profusely when putting up Christmas decorations. 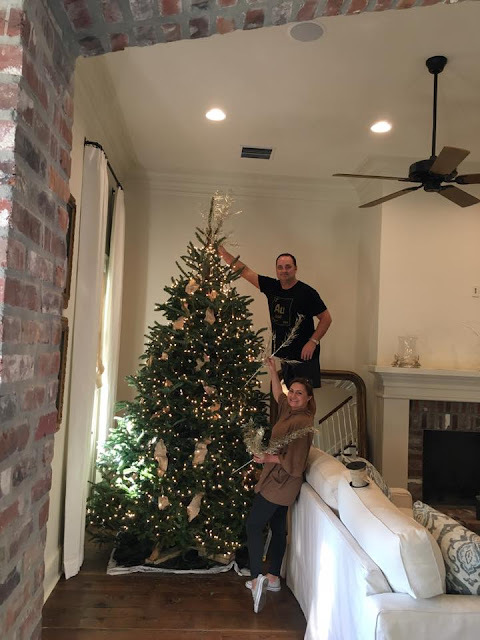 On Friday, I had the privilege to decorate my sister and BIL's new home in shorts and a light t-shirt. Starting from scratch is always fun for me. The new home is in the style of A. Hayes Town. 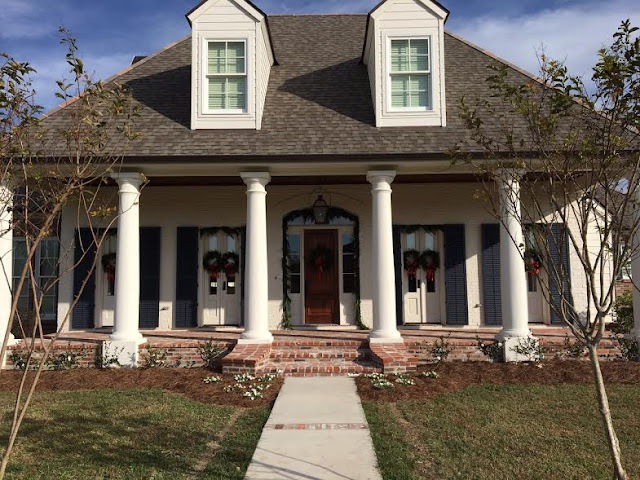 It is very Southern with many French touches. The details of the custom home are outstanding. I hope to show you more of the inside later. 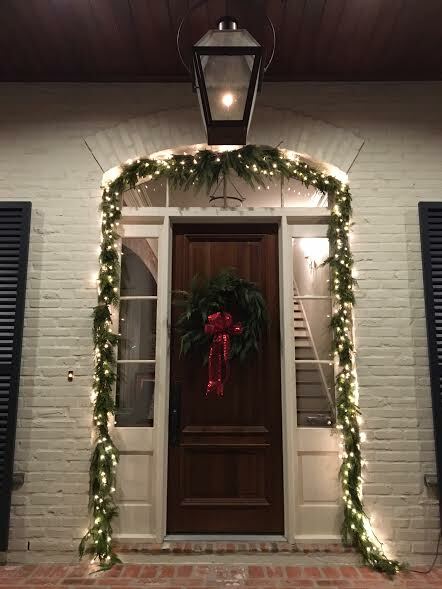 My sister is very understated and likes classic design, so the outside features cedar garlands and wreaths with simple red ribbons. 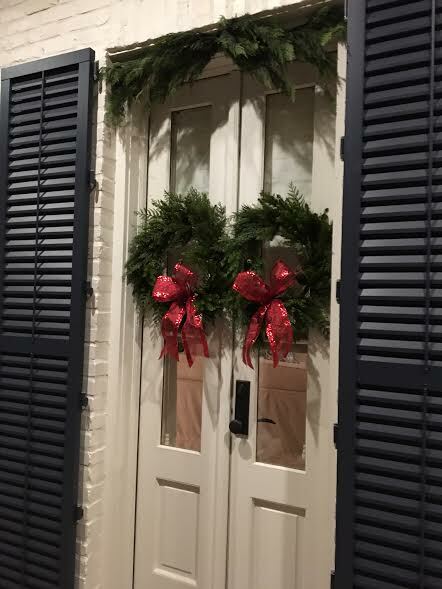 You really cannot top the look of greenery and red bows. 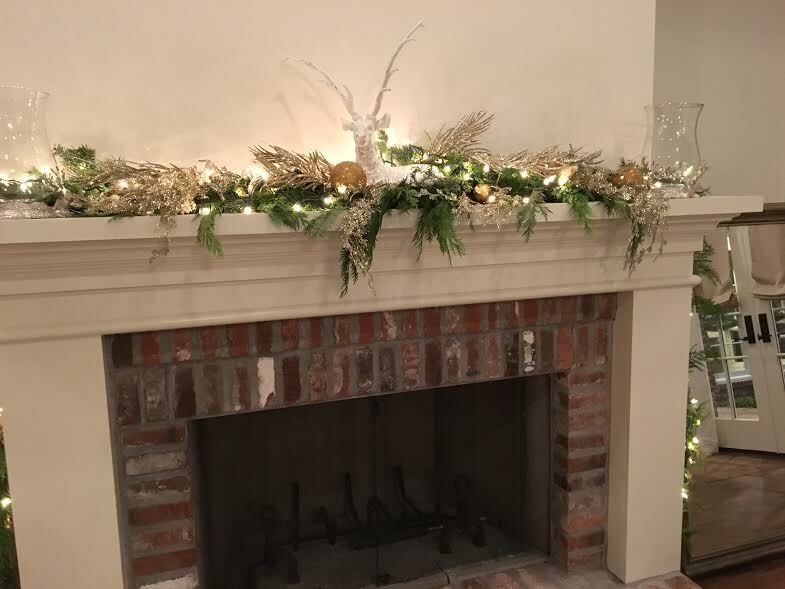 My sister is the one in my family who is partial to traditional Christmas decorating. After all, she wanted all of our childhood ornaments and collections. I think of that as "junk". 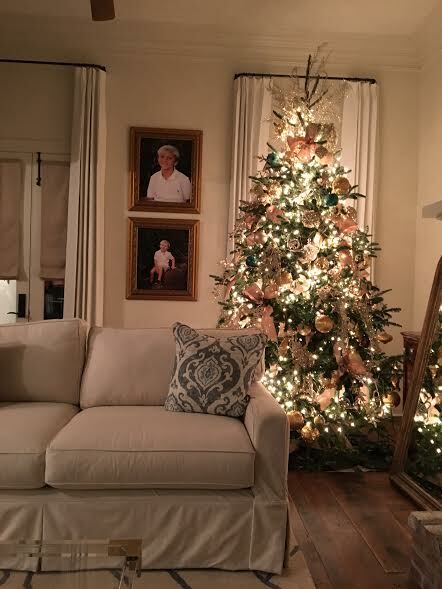 She really had a hard time getting out of her comfort zone of the typical and classic green and red Christmas. Her living area does not accept the traditional reds and greens easily. She required a more formal look. 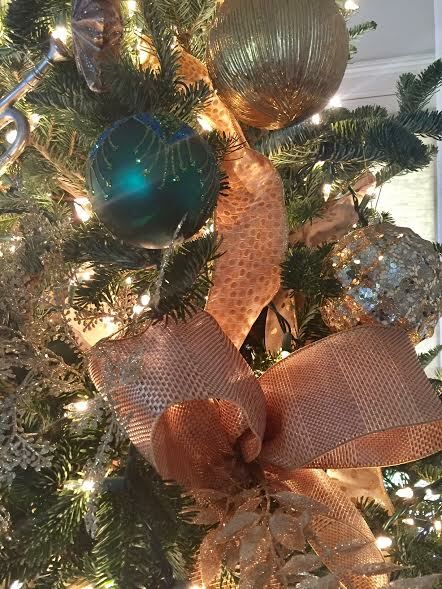 We decided on a tree featuring burnished golds and silvers with touches of champagnes and a pop of turquoise. I really love the touch of turquoise in the living area. I want to add peacock feathers too. 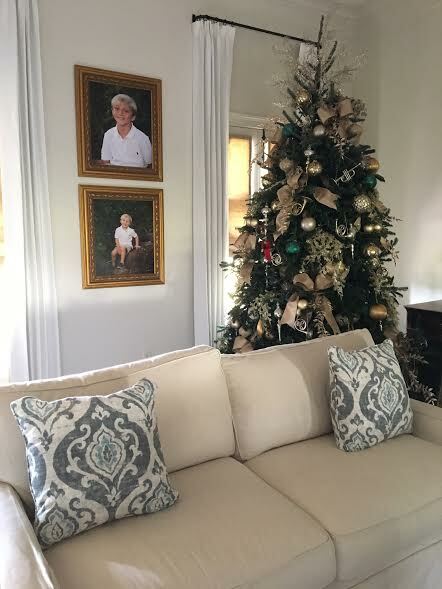 A tree skirt will be added. I informed my sister to get a drop cloth. I also love the men's fabric ribbons. 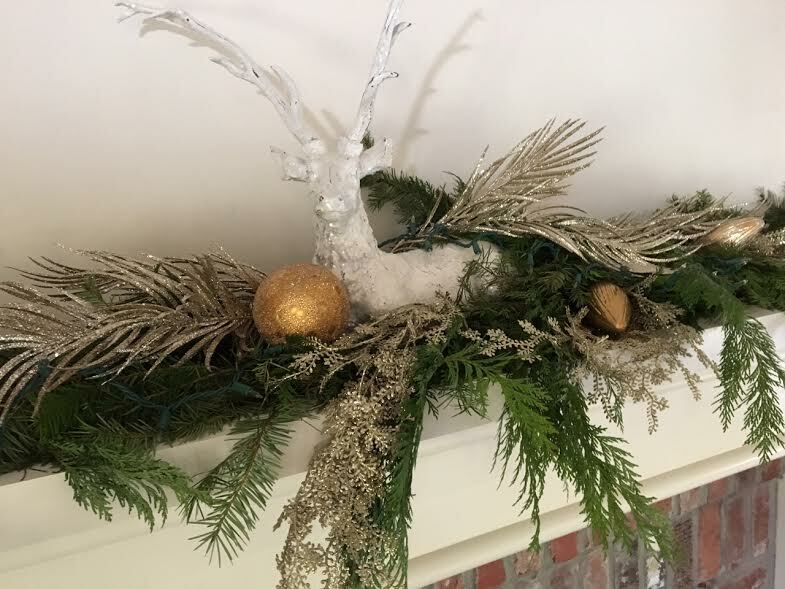 The mantle is decked in live mixed green garland and atop sits a glittered white deer. Two silver deer head hurricanes complete the look. The mirrors are finally hung!!! No decision on an art piece yet. I have a Carol Hallock in mind. 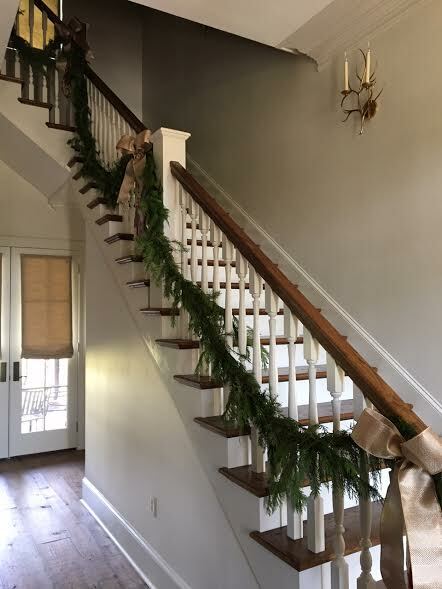 Even the staircase railings feature live garlands and needlepoint stockings. 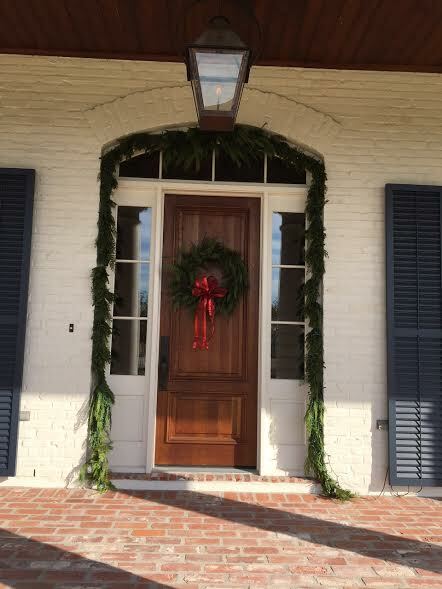 Thanks to my elves, J and Laurie, who helped make the experience an easier one. And I was not too bossy (I hope!). Notice Jeff with his mimosa. 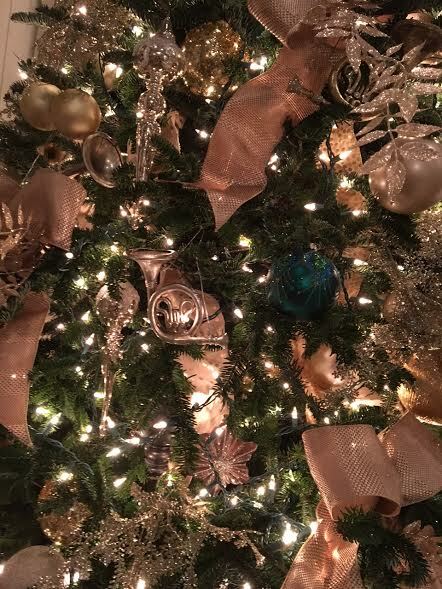 Thank you for sharing this gorgeous tree. My grandmother was A. Hayes Town's secretary at one point. She was so proud of that. Ron your decor is gorgeous and your sister's home is stunning. Congrats on the magazine feature too. Thanks, and it sure is. Absolutely stunning!! You're so talented, Ron! Merry, Merry! What a beautiful home! And you did a great job with the decor. 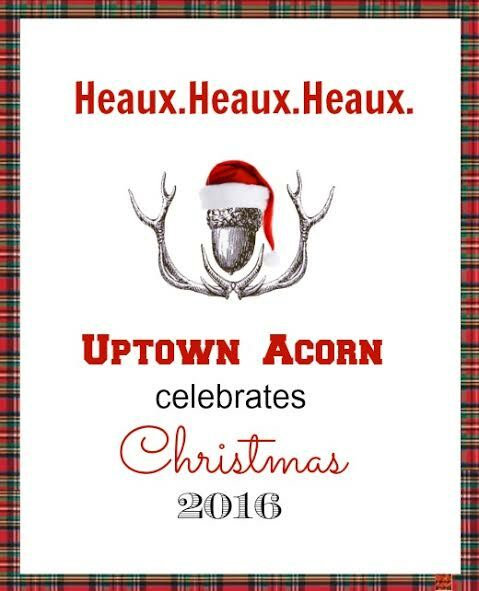 I wish she would give you free rein and let you deck it out Uptown Acorn style! 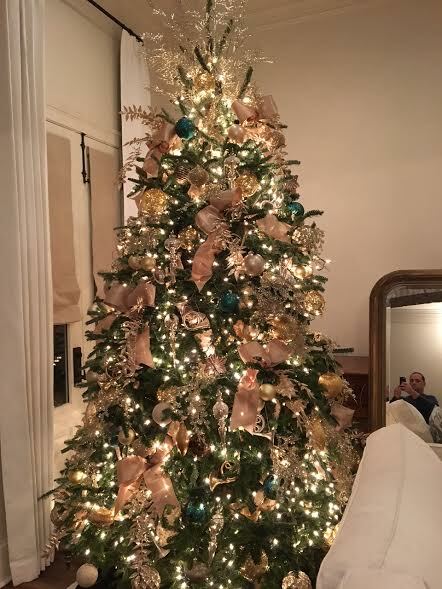 Gorgeous tree, Ron. You just have the knack, cher. Such a gorgeous home. How fun to be able to decorate it. Congrats again on your fabulous feature. I haven't seen you drop by my blog for quite some time. There is a lovely snowflake tablescape I posted today. Luvly! 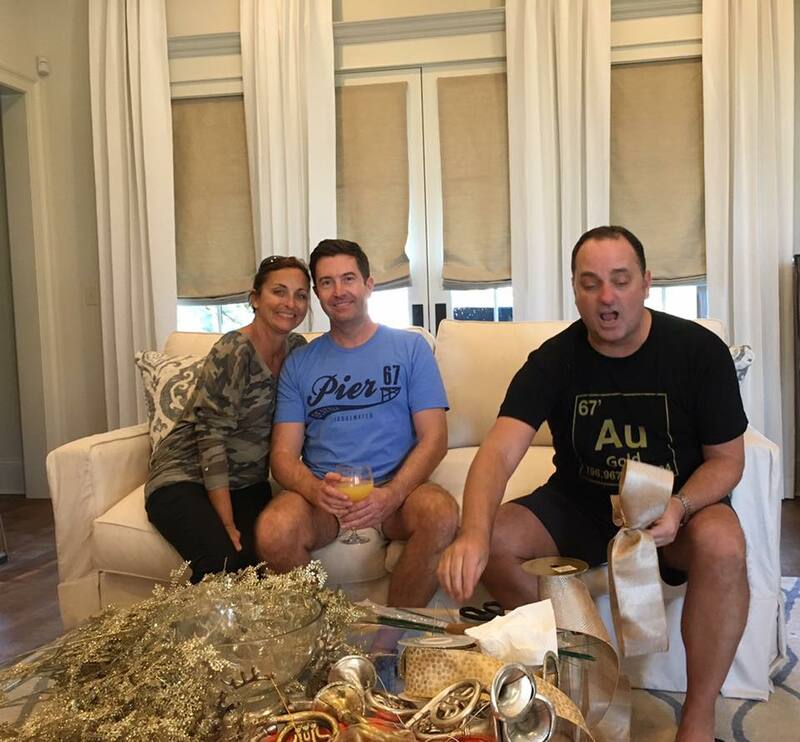 😀 He's got the best idea with the mimosa. Go Jeff! 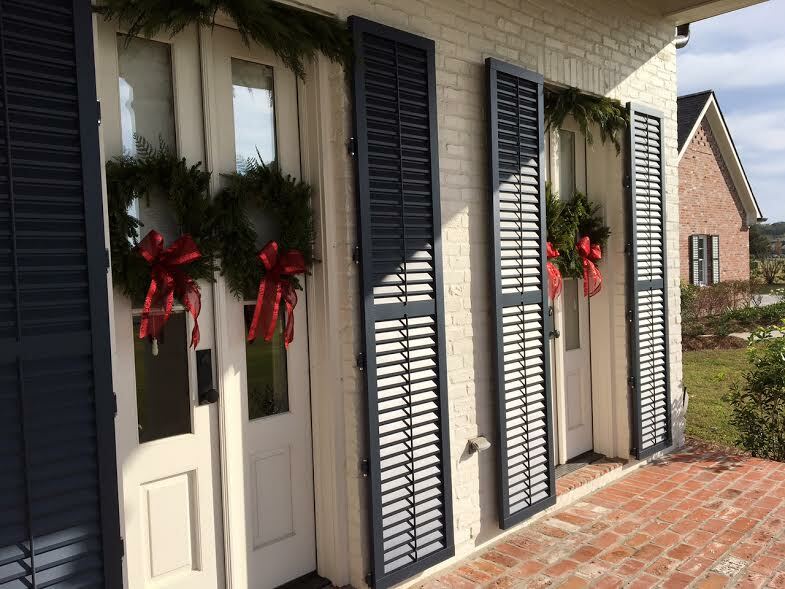 Nothing like the sultry south for holiday decorating , no? Congratulations on the feature. 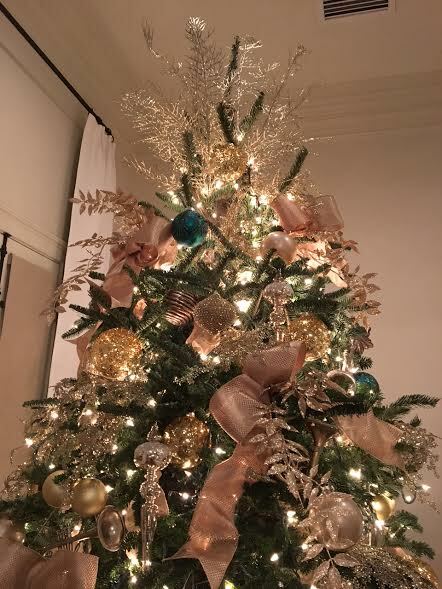 This tree is beautiful and I trust she loves it! The colors you chose are very pretty and I love the bows. The mantel is beautiful. 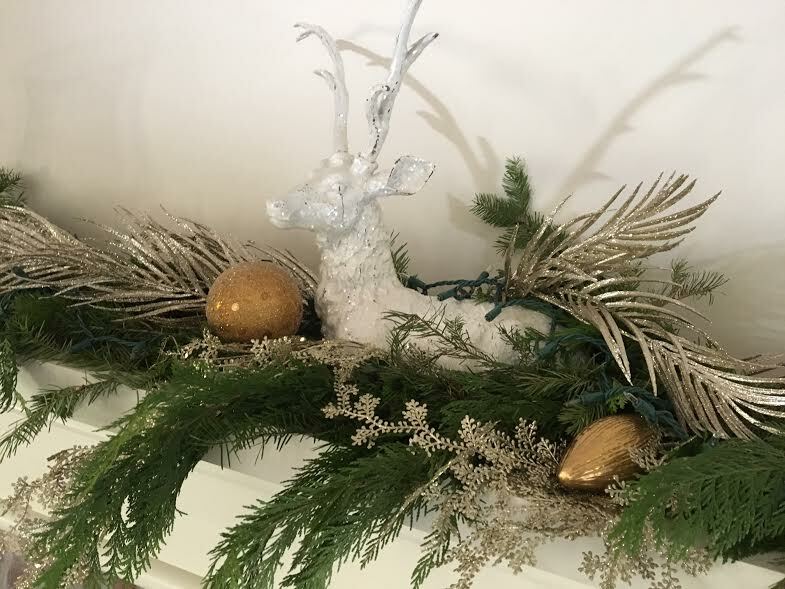 I have a standing reindeer I'm featuring in the center of my mantel this year (which isn't done). I'll have to visit your other feature post! 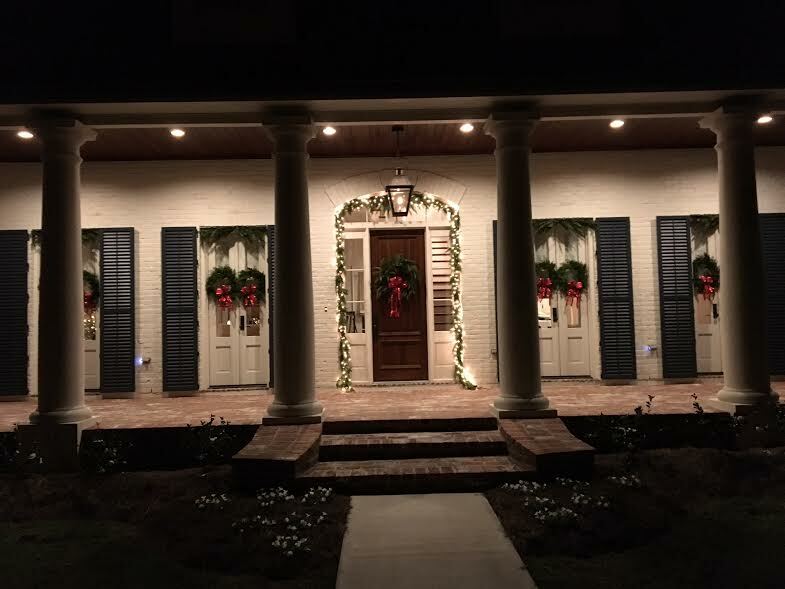 Your sister's home is beautiful- love the classic touches- especially those doors. 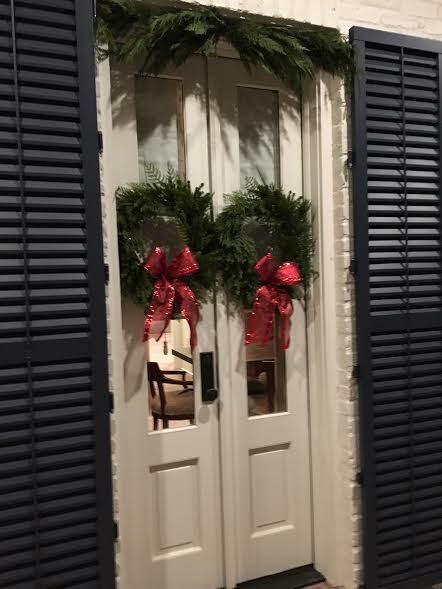 The wreaths are perfect! I love the classic touches too. Thanks so much. Absolutely love her house! Your work looks beautiful. I'm doing almost all red and green this year! I think it's the first time I've ever actually gone with those two together as the main colors! I'm loving it. Thanks Stephen. I love her house. I cannot wait to see your tree. 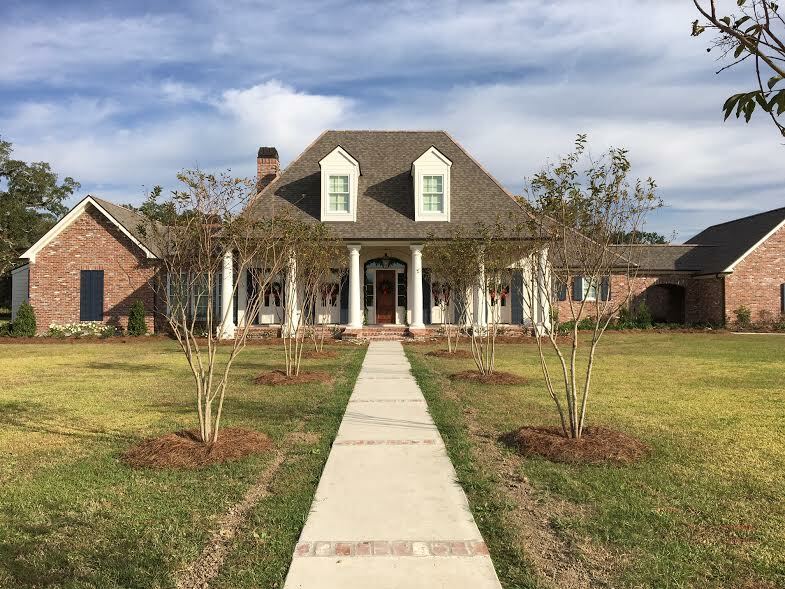 Ron, your sister's home is stunning! 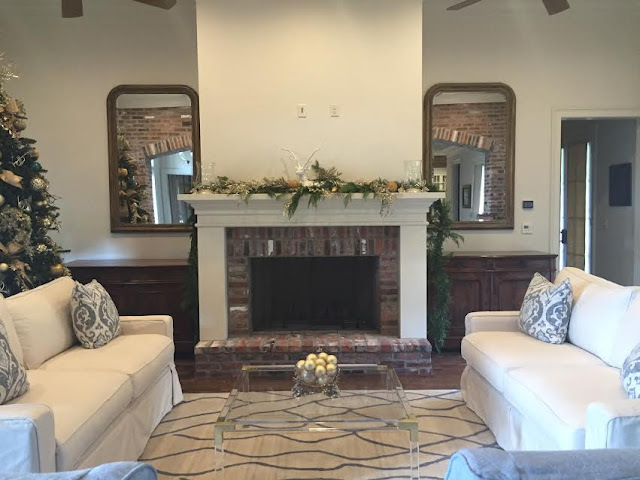 You did an amazing job with the decor, while staying true to her style and taste. Congrats on your feature, as well! You rock! 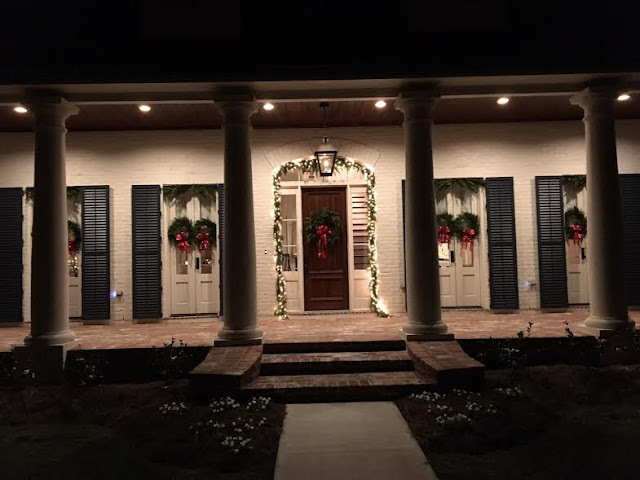 Your sister's home is gorgeous and you have selected the perfect holiday decorations. This house is an absolute dream, my all-time favorite style. The exterior holiday greens and red ribbon is perfect. 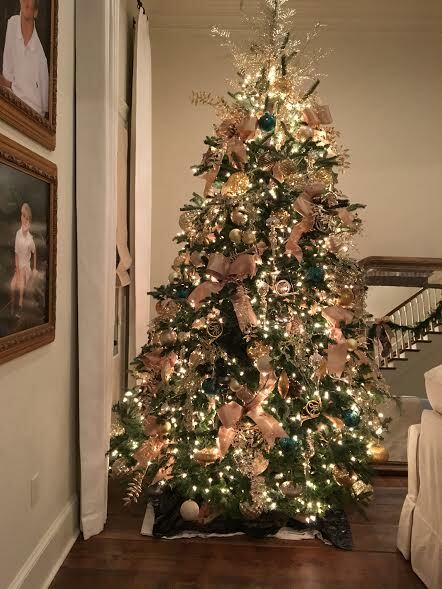 The tree is lovely, too, but I guess I am a bit like your sister, in that I like reds and greens as well although I have done it different ways over the years. 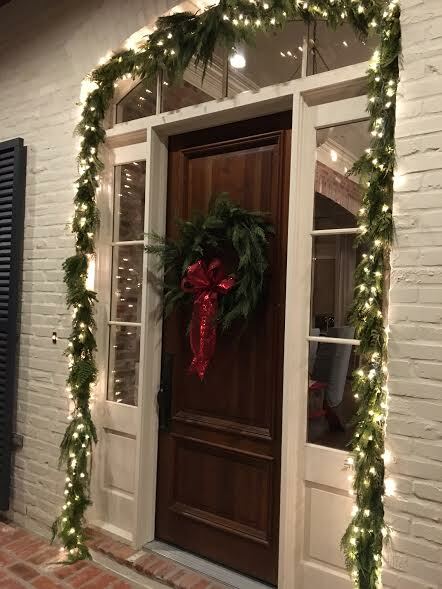 How did you hang the greenery above the French doors?